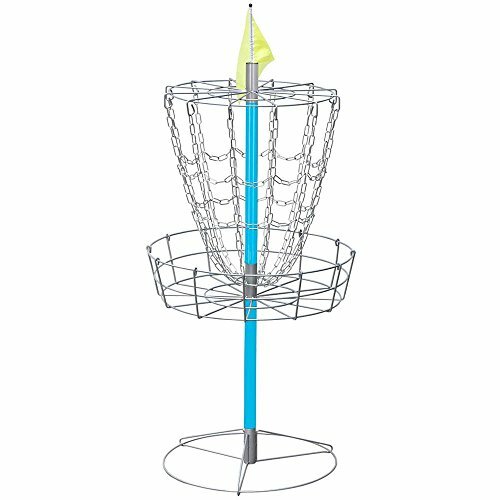 HIGH QUALITY: This disc golf basket is constructed of fully painted metal frame and chains, rust and weather resistant basket is durable enough to withstand sun, wind, rain and snow.Simple structured basket only takes a few minutes to assemble and disassemble under the detailed instructions. STABLE & STURDY: Solid basket contains 12 strands of heavy duty chain for better catching; welded joints and big base frame reinforce the stability of this basket, no need to worry about tipping over by the hit from the disc or wind. PORTABLE & EASY STORAGE: Built in a lightweight yet sturdy structure, convenient to move and transport, no need to attach to ground; can be simply disassembled in to a flat and compact size for storage when not in use. THOUGHTFUL DESIGN: Features with a 25.7" basket for catching and storing the disc; comes with an eye-catching yellow flag to help improve the accuracy of your throw. PRACTICAL: This regular size disc golf basket is ideal for both starters and disc golf lovers to use in the park, back yard, school yard, basketball gym and so on; definitely a great accessory to practice and improve your short game.